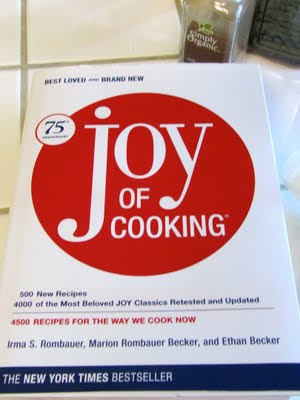 I love this cookbook, it has everything in here, from how to properly set a table for any occasion to how to de-shell crab. It's an all-in-one resource for any kind of cook, beginner or advanced. So I found a rib and BBQ sauce recipe in my new cookbook and went to town! I made a rub and my own bbq sauce from the recipes found in my book. And then I made a fruit salsa/salad for a side, which is something my mom always made when we had pork in the summer. I was pretty proud of my cooking after I sank my teeth into the tender, spicy ribs and we all sat in silence gnawing on our food. It was so tasty! 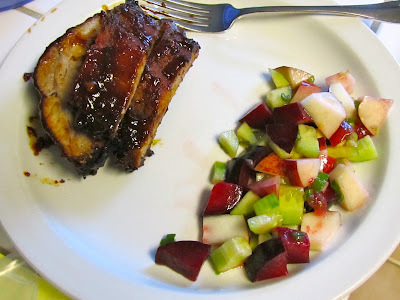 My dad did help a little by grilling the ribs at the end for about half and hour, but I did everything else. 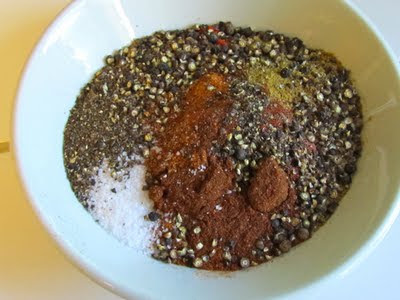 Rib rub! Right before the beer went in and then they went in the oven for an hour and a half. 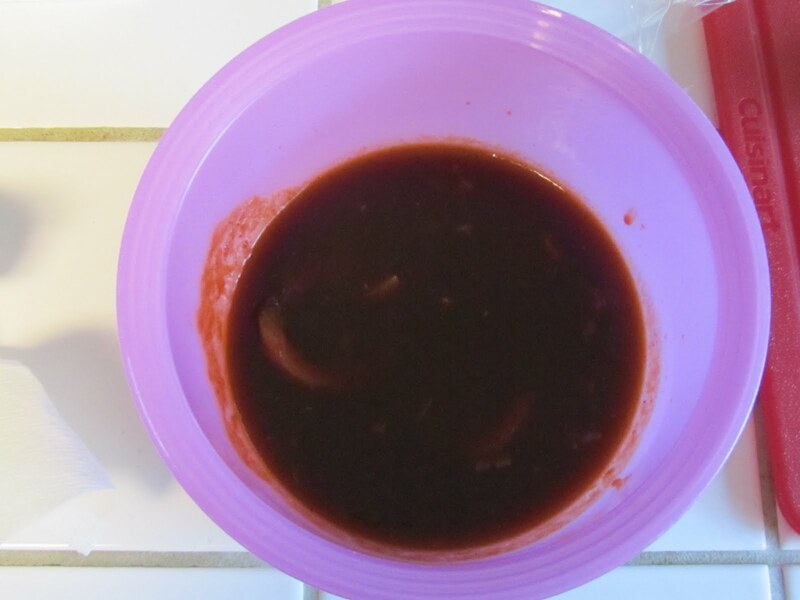 Finished BBQ sauce, for the ribs to baste in. Fruit salsa, nectarines, cucumber, plums and green onion with a tangy, sweet dressing. Ribs right off the grill. My plate about 15 minutes before it was all devoured! 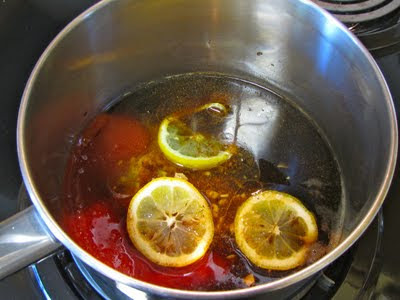 Simmer, stirring often, for 5-8 minutes, until it thickens. 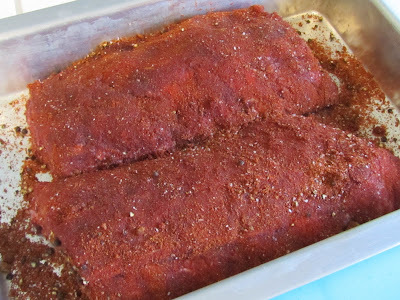 Use to baste the ribs while they are grilling. Preheat oven to 350 degrees F. Cover the ribs with foil and bake for 1 1/2 hours. To finish them on the grill, prepare a medium-hot grill fire. 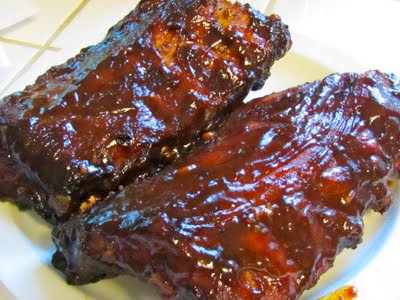 Baste the ribs with the sauce, then place meaty side up on the grill, close the lid, and grill until tender, 30 to 45 minutes, basting every 10 to 15 minutes. Mix together the vinegar, oil and sugar in a large serving bowl. 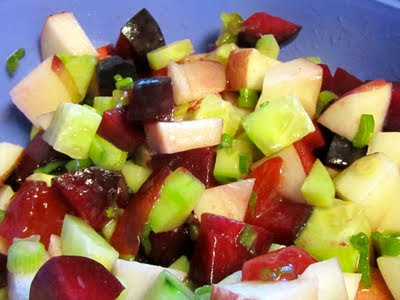 Once mixed, add the nectarines, plums, cucumber, and onions. Add a pinch of salt. Stir to combine and serve.